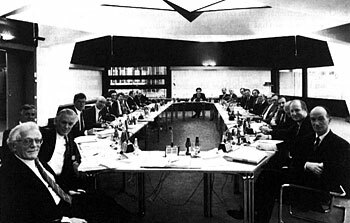 8 December 1987: The representatives of the eight member states (Belgium, Denmark, the Federal Republic of Germany, France, Italy, the Netherlands, Sweden and Switzerland) agreed that the European Southern Observatory shall embark upon the realization of this marvelous instrument. This decision expresses Europe's confidence in the ambition of her astronomical community and the ingenuity of her high-tech industry; together they will ensure that Europe will be second to none in the exploration of the Universe for a long time to come. 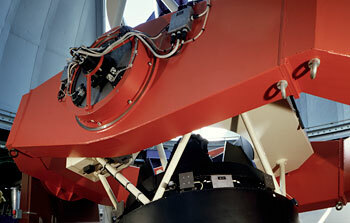 The VLT is an essential complement of Europe's astronomical research activities from space vehicles. 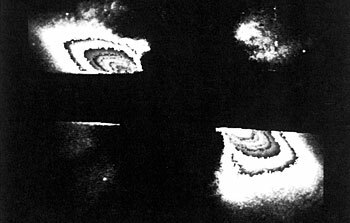 5 November 1987: The prototype of a new class of astrophysical phenomena has now been interpreted. Studies of other objects of the same type will open entirely new vistas in the exploration of the nature of distant galaxies. 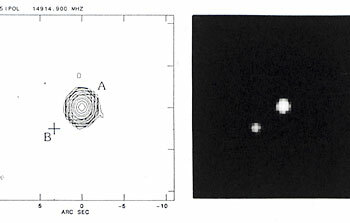 22 October 1987: The discovery of a new gravitational lens system in the southern constellation Cetus comes as a first exciting and fundamental result obtained by a group of European astronomers in the frame of the systematic search program they are carrying out at the ESO La Silla observatory. Not only did they find that the image of the highly luminous quasar (ESO8712 and ESO8713) UM673 is double, but they were also able to observe the distant galaxy that is responsible for this effect. Continued monitoring of this rare object may actually lead to cosmologically significant results about the size and the age of the Universe. 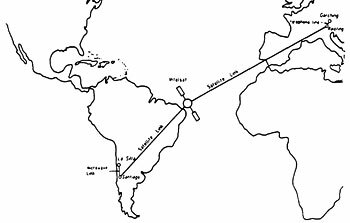 29 September 1987: ESO announces the establishment of the world's first system for interactive remote control of ground-based telescopes on another continent. 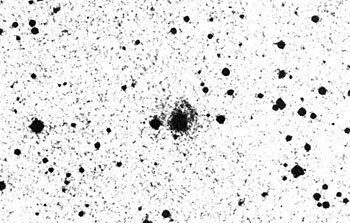 10 September 1987: A newly discovered quasar (eso8712) has been found to have a record redshift  of 4.11 and is therefore the hitherto most distant known object in the Universe. 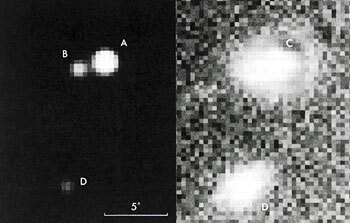 15 July 1987: The discovery of what may be the first true binary quasar has been reported by a European-American team of astronomers using a combination of optical, spectral, and radio observations. 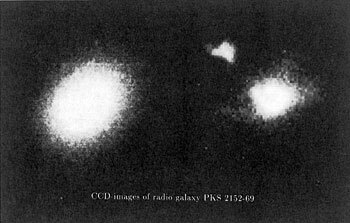 The pairs of nearly identical quasars, separated by only 4.2 arcseconds projection on the sky, have a redshift of 1.345, corresponding to a distance of some 12 billion light-years from Earth (according to the standard cosmological distance scale) and are apparently associated with the radio source PKS 1145-071 in the constellation Crater . 8 July 1987: The first full-scale, international meeting about the bright Supernova 1987A in the Large Magellanic Cloud (LMC) was held at the European Southern Observatory in Garching near Munich on July 6 - 8, 1987. ESO was a natural meeting place in view of the many different observational studies of SN 1987A which have been carried out at the ESO La Silla observatory. 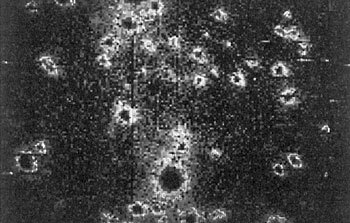 3 July 1987: The first observations of a long-lived radioactive isotope outside the Solar System indicate that the Universe may be younger than previously thought. Using one of the world's most powerful spectrometers, located at the ESO La Silla observatory in Chile, Professor Harvey R. Butcher of the University of Groningen, The Netherlands, has detected for the first time the radioactive element Thorium-232 in stars. A comparison of its abundance in old and young stars failed to show the expected differences. This means that the total age of Thorium-232 in these stars must be smaller than about 10 Gyr , instead of the previously estimated 16 - 18 Gyr. 16 June 1987: Of all exotic objects predicted by current theories, none are as elusive as the Black Holes. Despite great efforts, their existence has never been unambiguously proven by astronomical observations. 25 May 1987: An exhibition about the European Southern Observatory will be open to the public at the Heysel Planetarium, Brussels, Belgium, on June 6 - 15, 1987 (all days, also during the weekends, from 10:00 to 16:30). 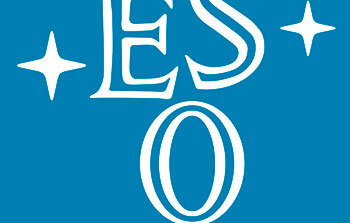 It has been organized in a collaboration between ESO, the Brussels Planetarium and the Belgian National ESO Committee. 14 May 1987: In these days, northern astronomers have reason to envy their colleagues in the south. By chance, the two main events in observational astronomy at this moment both occur deep in the southern sky and they can therefore not be observed from the astronomical centres in the northern hemisphere. 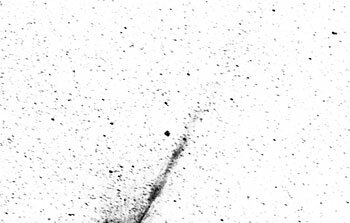 31 March 1987: “This supernova is different from all others observed so far".That is the unanimous conclusion of astronomers who have observed supernova 1987A in the Large Magellanic Cloud (LMC) with ESO telescopes since the explosion in late February (see ESO 04/87 and ESO 05/87). The collective results from the ESO La Silla observatory of no less than 38 astronomers have now been submitted to the European journal Astronomy & Astrophysics where they will appear in six "Letters to the Editor'' in the May(I) 1987 issue. These articles cover astrometry, optical and infrared photometry, polarimetry, optical and infrared spectroscopy and high-resolution spectroscopy; they are immediately available in ESO Preprint no. 500 (March 30, 1987) which can be obtained by request to the ESO Information and Photographic Service. 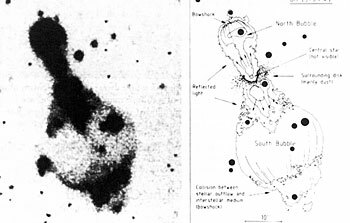 3 March 1987: One week after the explosion of a bright supernova (1987A) in the Large Magellanic Cloud (ESO 04/87), and after intensive observations at the European Southern Observatory and elsewhere in the southern hemisphere, it is now possible to draw several important conclusions about this unique event. 26 February 1987: Stars do not live forever - they are born and they die. All stars are born by contraction of matter in large interstellar clouds of gas and dust, but they do not all die in the same way. Heavy stars appear to end their active lives in gigantic supernova explosions (eso8608) while less massive stars (like our Sun) follow another path. 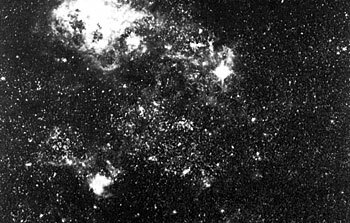 25 February 1987: Astronomers all over the world are highly excited about the sudden explosion of a supernova in the Large Magellanic Cloud (LMC), a small satellite galaxy to our own Milky Way Galaxy. The LMC is the nearest, external galaxy; its distance is only about 180.000 light years. 5 February 1987: A European group of astronomers has discovered an extreme example of `quasar-like' activity in an otherwise normal radio galaxy. What is most remarkable in this case is that the activity occurs not at the galaxy's centre, but in its halo at a distance of about 30000 light years from the centre. This important result, which is based on observations at the ESO La Silla observatory, opens new and exciting lines in galaxy research . 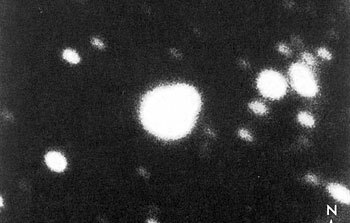 5 January 1987: Based on observations obtained at the European Southern Observatory (ESO), astronomers at the Space Telescope Science Institute (STScI) have uncovered the strongest evidence yet for the presence of a giant planetary or protoplanetary system accompanying a nearby star .